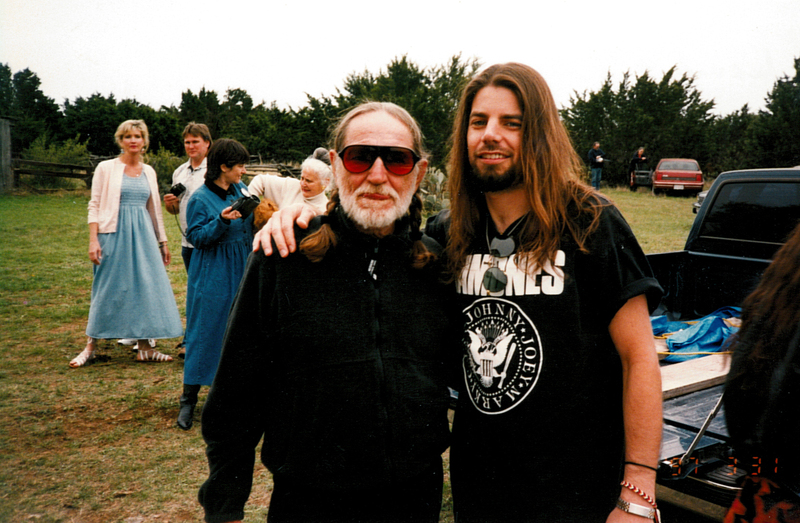 HAIR FARMERS: Going to church with Willie Nelson on Easter Sunday 1997. My Dad once half-joked that this photo captured his two favorite outlaws. My heroes have seldom been cowboys, but Willie Nelson is a clear exception. Along with other real-deal outlaws like Waylon Jennings, Merle Haggard and Johnny Cash, Willie was part of my childhood soundtrack thanks to Dad’s passing preference for country music. When I moved to Austin in 1995, it was hard not to notice I was in Willie’s world. Obviously, the man is a worldwide legend, but in Austin he’s more popular than, um, John Lennon (wink, wink). To this day, the sight of his tour bus is a personal point of pride. On Easter weekend 1997, the Red-Headed Stranger became a tad more familiar when I was invited to his land courtesy of my friend and former colleague, Christina Fajardo (who happens to be life-long best friends with Willie’s daughter, Lana). Joining me on this little adventure was my pal Marc DeHoyos from San Antonio. Besides meeting Willie, Marc had the added pleasure of phoning his friend to brag about also meeting Joe Ely. The reason for this shindig? Turns out Willie has/had this tradition of inviting friends out to “Willieville” in deep southwest Austin each year for his semi-intimate Easter gospel concert. 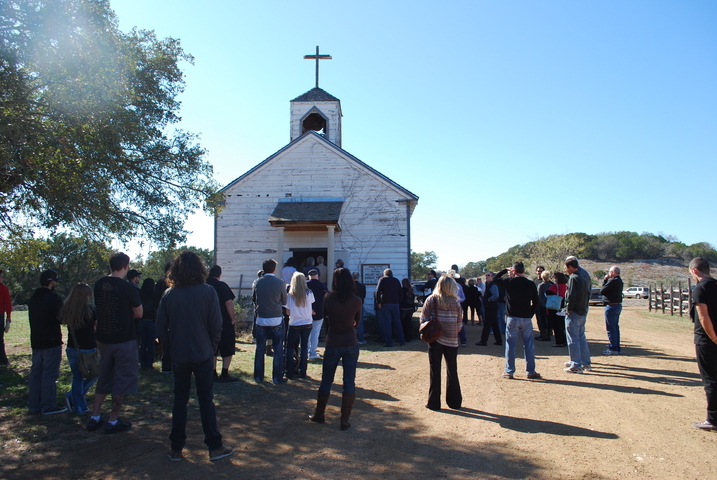 Located in the tiny town of Luck, Texas, the land is (or was) still home to the set of Willie’s 1986 movie “The Red-Headed Stranger,” complete with Old West saloon, bank, general store and small chapel, which was packed with in-the-know folks who knew it would double as Willie’s pulpit (Marc and I jockeyed for glimpses through the chapel’s back door). Following his gig, Willie wandered around and met his guests. When I introduced myself and told him my Dad was a fan, Willie started asking me all about my family, my upbringing, my job, etc. He seemed genuinely interested in knowing all about me, which cemented his reputation as a most hospitable host. From Willie’s place, Marc and I followed Lana to her spacious countryside house where a pass-the-guitar party was soon in full swing. The place was filled with food, drink and a museum’s worth of Willie memorabilia. While Marc and I secretly hoped for the second coming of Willie, we were more than happy to “settle” for the gracious hospitality of Lana and a house full of her Daddy’s holy rollers. Come to think of it, going to church on Easter was never so much fun. For more on Willie Nelson, go here. I want to be Metal Dave when I grow up! Ha ha. You don’t have to grow up to be Metal Dave! That’s a great feature meeting Country legend, him being totally cool with you. Brilliant stuff.. Been personally invited very cool indeed!! I love going to Church on Easter Sunday bit… Not the usual Easter Sunday service for sure….